Josh wasn’t able to do the spray painting part. And I’m not sure I would have let him, even if he could. I had to take the picture to the basement, which isn’t wheel-chair accessible. The smell of the paint was nauseating and it doesn’t take much to set off my gag reflex. I got the job done as quickly as I could. He was able to do the composition part. He picked the objects to lay on the canvas and where to place them. 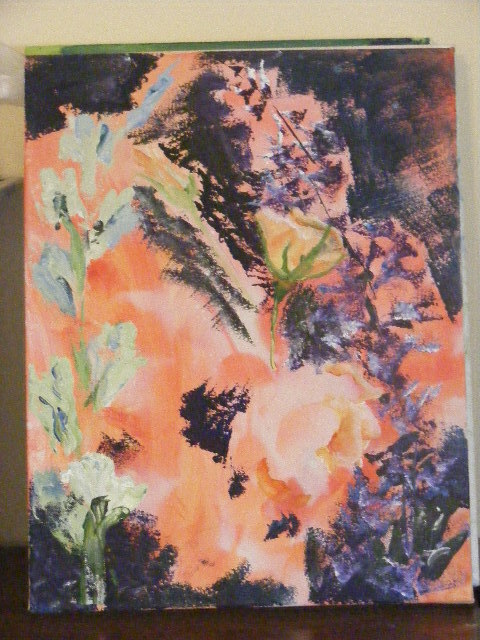 Once the paint was dry, he began to block in where the flowers would go, and started putting in part of the background. All of this was done with a sponge. I decided it would be a good idea for him to wear a glove. The laughter that came from us as I struggled to get his fingers in the right place. I’d get his thumb in, get three of his fingers in, only to discover I’d put them on the wrong fingers. While trying to fix that, the thumb would pop out. Needless to say, we ended up covered in paint. Hands, clothes, and wheelchair. But anything that rewards us with laughter is a good thing. Josh likes the sponge. And he loves acrylics. I never realized, how tense and cautious he would get when using watercolors. He knew he had to save his whites. And it would often take longer to get a grip on the paintbrush than it would to make the strokes. But with acrylics. My gosh, I felt like I was hanging onto to a wild man. His enthusiasm explodes. He attacks the canvas. He doesn’t worry about getting paint in the wrong spots because he knows he can paint over it. 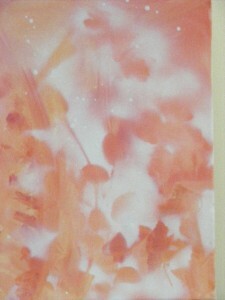 I think that energy can be seen in the acrylic paintings. Especially when they are hung next to one of his watercolors. The picture below shows where the flowers will eventually be. On the right side he’ll paint delphiniums. On the left side will be a stalk of gladiolas. In the middle will be three roses. One fully open, which will be the focal point, one half-open, and one in the bud stage. I love this piece! Will it be for sale? Hi, when work is ready for sale it will move from the work in progress page to the work for sale page. The paintings go through many changes. What you like in these early stages, you might not like when it’s finished. The completed picture and price will be available under the work for sale column. I’ll be adding to that page every week. Thank you for checking out his website. I can guarantee there will be a lot of interesting and fun info coming soon. Beautiful! I love your acrylics work, Josh! This is the right medium for you. Your art is beautiful, Josh! Virginia, Thank you for stopping by and visiting. Josh is having such an exciting year. Under Something new you can follow his journey into getting physical. We’re searching for a system that will talk for him. I’m determined that this is the year he gets a voice. His artwork is exploding with new energy. We’re having a ton of fun.